I was pleased to finally get some decent sized deluxe samples in my Birchbox January 2013 box, however I really wish they would look at profiles because I don’t know where else to check off “dry skin” before I stop getting mattifying products. The Alessandro handcreme is very thick and you don’t need a lot of it to moisturize your hands. The scent reminds me of cherry cough syrup. Weird I know, but it has that artificial cherry scent to it (which I don’t personally like). It’s always nice getting a teeny tube of mascara to keep in your purse and this tube is indeed teeny! The Birchbox website says of this product, “The wand features one smudge-free Volumizing Black Mascara and one Lengthening Fiber Black Mascara.” however the sample obviously doesn’t have dual products so I’m unsure of which “end” I received. I’m excited to try the Kérastase shampoo and conditioner because it’s meant for dry to very dry hair, which is what I have. I normally use Moroccan Oil shampoo and conditioner so it’ll be interesting to see the comparison! The fragrance sample smells AMAZING. Normally I can’t stand fragrance samples but this? Citrus with a touch of floral… very Springtime! 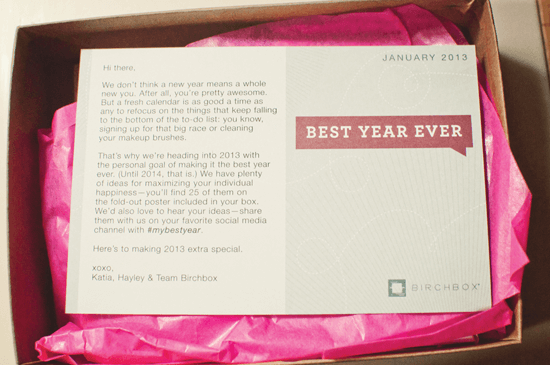 For those of you who are also Birchbox members, what did you get in your box this month? I love reading what other people get – my box was TOTALLY different (maybe it was #19? I can’t remember now, my friend Laura always posts a link to the list) and I’m very jealous of your hair stuff and your pink grapefruit scent. I really am pleasantly surprised by the fragrance! Normally I get really teeny-bopper samples so to get something that doesn’t smell like fruit loops? AMAZING! In general I love citrus scents, it’s why Clinique Happy is my HG (holy grail!) perfume of all time LOL! 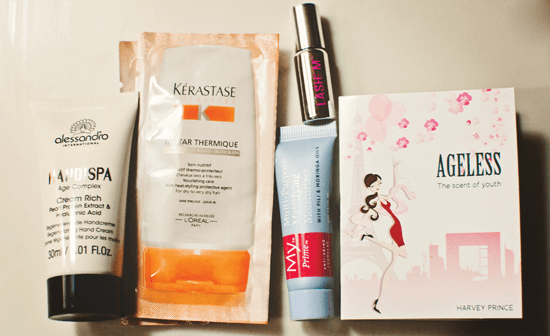 I think our January Birchboxes were somewhat similar! I got the Kerastase and Lashem. Sadly January’s box was my last Birchbox, as I canceled it in favor of Ipsy.